Hotel Chocolat have come up trumps again and are offering one lucky Gastronomy Domine reader a Christmas chocolate selection box and a copy of the Hotel Chocolat 101 Best Loved Chocolate Recipes book. I get to sit back for this one – it’s your turn to do the cooking. 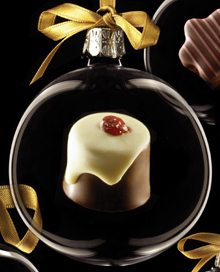 Hotel Chocolat is looking for your very best Christmas-themed chocolate recipes. Think Christmas choc-chip cookies, chocolate yule log, or chocolate Christmas puddings. All you have to do is to submit your recipe (the more original the better), and you could win lots of lovely chocolate. The winner of the Gastronomy Domine competition will also be automatically entered into the Hotel Chocolat Grand Prize recipe competition, and could win even more seasonal chocolate goodies! And believe me, they are good – I’ve just been to a chocolate tasting with them and was blown away by some of the Christmas selections. So, are you the best chocolate cook in the country? Only one way to find out – click here to submit your entry. The competition page will recognise that you’ve come from Gastronomy Domine, so get your weighing scales out and start cooking! The competition closes at 11.59pm on December 10 2007. Here’s an eastern European way with cucumbers. This is particularly lovely if you can get your hands on home-grown cucumbers, which are often sweeter than the ones you find at the greengrocer. The cucumbers and some shallots are salted to drive out excess moisture and make them extra-crisp, then chilled and tossed in sharp dressing with crème fraîche. The mildly acidic dressing reacts with the cucumbers to form a lovely, lightly foaming texture. This salad is delicious with rich meats and with oily fish. Slice the cucumber and the shallot as finely as possible, and layer the slices, sprinkling them with salt as you go, in a colander. Put a heavy plate on top of the slices inside the colander, and leave it to drain for four hours. Blot the cucumber and shallot pieces on kitchen paper and put in a large bowl, then chill in the fridge for at least an hour. Add the chilled crème fraîche, some pepper and the vinegar to the dish and toss the salad vigorously with two spoons. The mixture should be looking frothy. Return to the fridge for half and hour, toss again, dress with the chives and serve cold. I’m a little distracted today – I just found out this morning that my friend Oli received his long-awaited lung transplant in the night. I’m sure you’ll all join me in wishing him, his girlfriend and his family all the best. And please sign up to the donor register! Michelin, the canonical French restaurant guide series, have just released their first Guide Rouge to Las Vegas. If you read this blog regularly, you’ll know I spend rather more time in Vegas than is natural for someone living in Cambridgeshire. This is largely down to the city’s amazing proliferation of high-quality restaurants. The days of ubiquitous shrimp cocktails and foot-long hot dogs are long gone (although, of course, this is a consumer paradise, so if you want a foot-long-cocktail-dog, you are bound to be able to find it somewhere). These days, you’ll see real, serious cooking around almost every corner – here’s an Alain Ducasse restaurant, there a Michael Mina one; Thomas Keller of the French Laundry runs Bouchon, a bistro serving up, among other things, Vegas’s very best breakfast at the Venetian hotel; Joël Robuchon wants you to exchange all your poker winnings for a $1000 per head meal at The Mansion; home-grown chefs like André Rochat serve up exquisite French meals downtown . . . these days, Vegas is a serious, grown-up foodie destination. I know the city’s restaurants pretty well, and so I was surprised to read Michelin’s final ratings. They’ve done a pretty good job of drilling down 16 of the city’s best restaurants (although I’d quibble with some of the choices, especially at the bottom end) – but the number of restaurants awarded two and three stars is alarmingly small given the range and quality on offer in the city, particularly when you compare the food, location and service with restaurants in France, where the Guide Rouge is far more generous with the stars. Paris boasts 14 restaurants with three stars – even Strasbourg gets two. I think there are a few reasons for this. First of all, you’ll notice the preponderance of French restaurants in the above list – 12 of the 16 given stars cook in the French style. Michelin have historically valued French cooking over other cuisines (and in the past I feel they’ve made mistakes when trying to extend their cultural ambit, as with London’s downright horrible Tamarind, an Indian restaurant which largely seemed to get its star for reasons of political correctness). 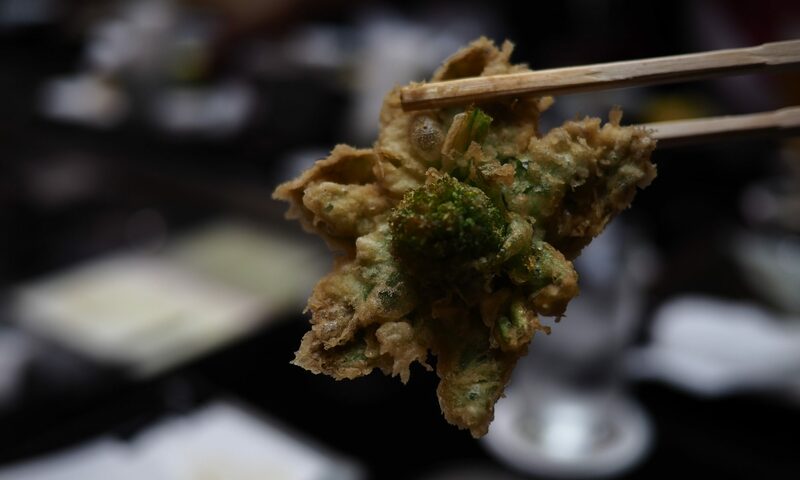 Still; Wing Lei in particular deserves more recognition than a single star and Nobu is a lazy choice; there are better Japanese restaurants in town like Shibuya at MGM Grand, Shintaro at Bellagio and Okada at the Wynn. It’s also surprising to see only one steakhouse on the list. Bradley Ogden is excellent, but one area where Las Vegas really excels is in presenting traditional American cuts of meat in thoughtful and, dare I say it, gastronomic ways. Michael Mina’s Stripsteak at Mandalay Bay, Charlie Palmer Steak at the Four Seasons or Delmonico at the Venetian should, by any metric that Bradley Ogden measures up to, be included here too. Secondly, Michelin seem to be making their old mistake of treating décor as an issue as important as the food. Mix at Mandalay Bay is an Alain Ducasse restaurant in name only – I would be surprised if he sets foot in there from one year to the next, and foodwise, it’s not at all comparable to his (wonderful) Paris ventures. It is, however, one of the most beautiful dining rooms you’ll find in the world, and I suspect that this is where it earns its star. 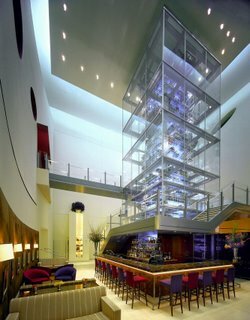 Mix is a restaurant I actively avoid eating in, although the attached bar is great and worth a visit – you get all that wonderful interior design to look at, a great view all the way down the strip and an expensive Martini. 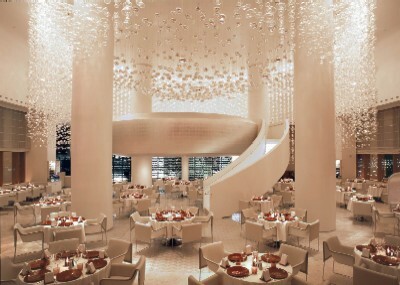 Similarly, Aureole (also at Mandalay Bay) is another good-to-middling restaurant with a breathtaking dining room. Aureole boasts a 42-foot wine tower with ‘wine angels’; waiting staff who abseil up and down the thing to retrieve the bottle you’ve asked for. It’s not Charlie Palmer’s best restaurant in town – the steakhouse at the Four Seasons beats Aureole for food, and also for its wonderful view from the very top of the tower the Four Seasons inhabits. feel that there’s still a snobbish refusal to countenance that American food can possibly be as good as what you can find in France. Any of the two-star restaurants might, I suspect, have scored higher if they’d been located in a French city. And a few of those one-star restaurants also deserve bumping up a grade. So buy the guide if you like red, but don’t rely on it for an accurate picture of Las Vegas’s dining landscape. If you like to travel with a restaurant guide, Zagat serves Las Vegas well, although it does sometimes get a little exuberant. I’ve always liked the series, which sends its own reviewers to restaurants but also builds its short reviews around the thousands of experiences that its readers send in – the Vegas guide also includes a nightlife section. (The Zagat guide to Paris is, for me, rather more reliable than the equivalent Guide Rouge.) The AAA guides are useful and reliable for eating in North America, and several Las Vegas restaurants make their 5-diamond category. Keep an eye on awards from the James Beard foundation as well – if they give a restaurant or a chef a nod, you should pay attention and eat there. You can also get a surprisingly good estimate of a restaurant’s quality by looking at its menu, and these are increasingly available online at the restaurants’ websites. Finally, there are some really excellent websites full of reviews by foodies who love Vegas. I particularly like Larry’s Las Vegas Restaurant Guide, which explores a really eclectic selection of restaurants. If, like me, you are now drowning in quince jelly (this is not a bad thing, per se, given that it makes a great gift and will keep in its jar for years), you may be looking for something else to do with your excess quinces. I know my parents have a whole stable filled with them, lined up neatly in cardboard crates. Like apples, the fruits will keep well in a cool, dry and dark place – check on them regularly as you would with apples though, because once one goes bad the rest will soon follow unless you remove it and throw it away immediately. Membrillo, or quince cheese, is something you may have spotted on fashionable cheeseboards. It’s not a cheese at all, but a lovely heavy, sweet gel made from the flesh of the quince boiled down with sugar. It’s a wonderful contrast to salty cheeses like manchego – one of my favourite midnight snacks is simply a hunk sawn off the end of the piece of parmesan that’s always in the fridge, nibbled with a spoonful of quince cheese. When your quince cheese is ready, it will keep almost indefinitely in the fridge. I preserve mine in jars and spoon out chunks – some people prefer to make it in moulds, chill the moulds and turn the finished membrillo out when cold, then keep the pretty blocks wrapped in greaseproof paper and tin foil. Peel and core the quinces and cut them into chunks. Quinces are an abominably tough fruit to work with, so make sure your knife is extremely sharp and be sure to protect your fingers from slips. Put the quince pieces in a large saucepan and cover with water, cover with the lid, then simmer very gently for around three hours until the fruit is soft when poked with a fork. It will have turned a lovely lipstick pink. Drain the pieces and weigh them, and measure out an equal weight of sugar. Put the quince pieces in the food processor and blitz until you have a paste, then combine the paste with the sugar and the juice and zest of the lemon in a saucepan with a thick bottom (an enamelled cast-iron pan like one from Le Creuset is really useful here). Simmer the mixture over a very, very low flame, stirring until the sugar has all dissolved in the quince paste. Continue to simmer gently without a lid, stirring every now and then to make sure the bottom does not catch, for about two hours, until the paste is a deep red-brown and your spoon will stand up in it. 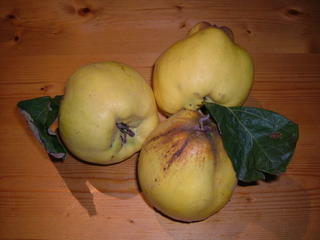 Spoon the quince cheese into sterilised jars and cover the top with a waxed disc before you put the lid on. The jars will keep in the cupboard pretty much indefinitely, but will need to be refrigerated once opened. If you go to Istanbul expecting kebabs, meatballs and other chunks of protein, you might be pleased to find that there is also a rich tradition of salads, cooked vegetable dishes (especially aubergine) and dolmades, or stuffed vegetables. This simple salad pops up all over the place, and it’s a really good accompaniment for meat dishes – the fresh vegetables and tart lemon juice counter the wonderful oily richness of Turkish food like nothing else. I made this last night, but the photo at the top of the page is of an identical salad I ate in a little restaurant next to the Bosphorus – unfortunately, I still don’t have my camera so couldn’t photograph last night’s version. Mine turned out pretty much exactly like the restaurant one, though: this is a very quick, very easy dish with half an hour’s thumb-twiddling in the middle. Slice the onion very finely and chop the parsley roughly. Put them together in a bowl and squeeze over the juice of half a lemon and two tablespoons of olive oil. Set aside for thirty minutes before you put the rest of the dish together. When the thirty minutes is up, dice the tomatoes and peel and dice the cucumber – the pieces of tomato and cucumber should be small and even. Slice the chilli into thin rings. Mix the chilli, tomatoes and cucumber together in your serving dish and dress with the remaining olive oil and a squeeze of lemon juice. Place the onion slices and parsley on top of the dish and pour over any oily juices from the bowl. Bring the salad to the table with the onion on top, then allow the diners to mix it up themselves. It’s been an exciting few days. Some readers will be aware that I have a horrible allergic reaction to lobsters (face swells, airways close, scalp comes out in lumps, I get injected with adrenaline and then sleep for two days). Unfortunately, at a Chinese meal on Sunday where the rest of the family was munching their way through a couple of lobsters while I stuck to crab, I must have accidentally ingested some, because the evening saw my eyelids slowly but surely swelling up to resemble one of those bobbly goldfish. The rest of my face soon followed, and I’ve been lying under a duvet, groaning, ever since. Then, as soon as I felt well enough to tackle a post here, I realised that I’ve left my camera at a party the day before the lobster incident. Fortunately the party was at my parents’ house, where we were celebrating my lovely Dad’s 60th. The camera is safe and sound, but it is about 60 miles away, full of photos, and this does mean that two of the Turkish posts I was planning on making will have to wait until I have it back. Similarly, today’s post has no accompanying photographs – please imagine a cheering, dark red paste. Peel the tomatoes and the cucumber, and remove the stalk, interior ribs and seeds of the pepper. Chop the tomatoes, cucumber, pepper and spring onions as finely as you can without reducing them to a pulp (careful pulsing in the food processor will also do the job). Stir in all the other ingredients, tasting for seasoning. Serve at room temperature. I’ve just got back from Istanbul, where I spent several days gorging myself on kebabs, dates, grilled fish, honeycomb, morello cherry juice and other good things. I am currently too jetlagged to come up with any really sparkling prose, so this will mostly be a picture post from the city’s spice market, where about 100 small stalls in a covered bazaar sell everything from henna to sumac. It’s an essential shopping destination if you’re in the city and you’re at all interested in food. This stall was selling loukhoum (Turkish delight – here’s my recipe) and baclava, the tooth-hurtingly sweet pastries soaked in a sugar syrup that you might have had with coffee in Turkish or Greek restaurants. I did not sample the aphrodisiac delight on the right, but judging by the huge chunks that had obviously already been sold on the day I visited, some people must think it’s effective. Behind the blocks are tins of Iranian caviar. The caviar is also sold from blocks, sliced and then jarred. Nilgun, our excellent guide, suggested putting a dab of butter in the top of the jar to keep the caviar fresh. Raw spices, including several grades of flaked chilli and powdered paprika. I’d already tried some of the very dark chilli in the second row, sprinkled on a rotisserie chicken; we came away from the market with a little packet to use at home. At the left-hand side of the picture you can see almonds for sale, still in their shells; the dried roots at the front next to the bundles of cinnamon are turmeric and ginger. There’s more caviar in tins above the display, next to jars of pomegranate molasses. Raw honeycomb, kept behind glass to keep insects away. There was a big slab of this laid out every morning at our hotel breakfast; we squashed it with a fork to drive the honey out of the waxy comb, and then ate it with yoghurt, on croissants and on toast. This stall was labelling several substances as saffron. None of the yellow/orange things on offer was real saffron; the powder at the front was turmeric, and the fat orange stamens on the plastic trays at the left (much fatter than the thread-like real thing) were safflower, which doesn’t taste of much and is used primarily in dyes. Caveat emptor. Four grades of dates, some prunes, and two grades of apricots. Most stalls selling dried fruit sold hunza apricots in their dark, untreated form alongside the bright orange ones (which are treated with sulphur dioxide to preserve their colour). If you find the less attractive brown ones, buy them; all the flavour and aroma of the fresh fruit is concentrated in them, and they’re much better than the orange ones. We sampled several grades of date, and there was method in the pricing; the expensive ones really were the best, with thin skins and a moist, fudgy interior – it was hard to believe that what you were eating was a fruit. I’ve got some restaurant recommendations for you, some street food tips and some more market exploration coming up – watch this space.